I don’t like any of the Bronte siblings books. Jane Eyre is the only one of their books I have managed to finish. I hated it. I would not have picked this up if I hadn’t loved My Lady Jane. Even so, I picked it up with trepidation. Everything was fine. There is a great star crossed love story here. There are wild moors. There are broody gentlemen. There is a horrible school with an abusive headmaster. But there is also feminism, wit, charm, ghosts, and a happy ending that doesn’t make your skin crawl. 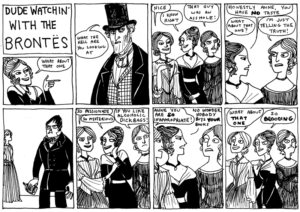 One cannot hate on the Brontës without including some Kate Beaton Hark! A Vagrant sass. As we all know, in Charlotte Brontë’s novel, the big romance is that poor, plain, malnourished, but beautiful in spirit Jane becomes a governess in the house of the wealthy, brooding, tragic Mr. Rochester. They fall in love and agree to marry, where it is revealed that there is already a live Mrs. Rochester in the house. The three authors of My Plain Jane create a plot where all these things happen, but there is a really good explanation, which involves ghosts. I don’t want to say too much. Though the authors insert a lot of silliness into their retelling of Jane Eyre, they also tackle some serious topics. In the novel of origin, Jane desperately wants to be loved and have a family, but she also has an independent life of the mind and values that about herself. For her sins she is rewarded with Mr. Rochester. 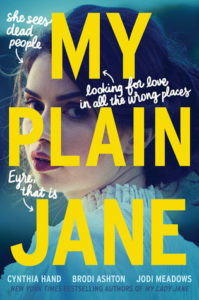 In My Plain Jane, Jane’s desire for love and family does lead her to an ill advised love, but the authors find a way to redeem Mr. Rochester while also making it clear that anyone who locks a woman in the attic is a bad, not at all romantic, person. The ridiculousness of the restrictions on women gets a lot of time too. I enjoyed this narration very much. Fiona Hardingham did a marvelous job. I have no idea how a true lover of Jane Eyre would feel about Hand, Ashton, and Meadows’ treatment of the novel, but I loved it. It fixed a lot of the things I hated. A happy ending was had by all and no teenagers married men old enough to be their father. Share the post "Finally, A Jane Eyre I Can Get Behind"
I’m with on the original – and I always wished I’d like Jane Eyre more because there is so much interesting literary criticism about the novel, including The Madwoman in the Attic. And I’ve tried novels inspired by or based on, and I haven’t really loved them either – I remember it seemed like The Madwoman Upstairs was getting buzz somewhere and I absolutely hated that one, too. See, I love Jane Eyre, but recognise very much that it’s a product of its time and can absolutely understand that it’s not for everyone. I have no problem with young women in Victorian times marrying men old enough to be their fathers – it was very common, after all, and Brontë really does spend the second half of the novel making sure that Jane isn’t just Rochester’s equal when she finally reunites with him and chooses to marry him, she is in fact the one in a position of power. She has youth, wealth (even having very generously split her inheritance with her cousins) and a promising future, while he is crippled and in reduced circumstances. 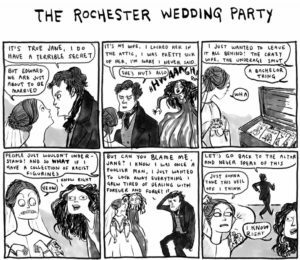 No matter how much the reader might disagree, Jane gets to choose the man she wants and Rochester is punished (very Biblically, in fact) for his previous sins. Throughout the novel, Jane is kind, virtuous and self-sacrificing and all her suffering leads her to her happy ending. I think Rochester is one of the true glorious bastards of literature. His non-proposal in the book (oh, you thought I was going to marry Blanche? Psych!) is rivaled only by Mr Darcy’s first (I want to marry you even though I hate your family and all your connections and am pretty sure it’s a really bad idea) in really awful marriage proposals. I am also a big fan of Wide Sargasso Sea by Jean Rhys (exploring Rochester’s first marriage) and have very much enjoyed The Eyre Affair, Jane Steele and this book – what can I say, I like a clever retelling, especially one that doesn’t take the source material too seriously. I need to sit down and finish my own review of this and start going though the rest of my backlog, but I’m enjoying rereading the Kate Daniels series so much right now that I don’t want anything to distract me from it. The Eyre Affair was fun, Jane Steele I mostly liked but I preferred the author’s other books. I am planning on doing a reread of Jane Eyre as my This Old Thing square, and will be doing the audiobook version. It definitely proved rather illuminating with Austen’s Persuasion. Okay, I was going to come have thoughts about Jane Eyre, but Malin did it first, so basically just what Malin said. I’m reading Wide Sargasso Sea later this year to fill in a Read Harder Challenge requirement. I’m excited! Oh, but I HATE Wuthering Heights, so if you feel about JE the way I feel about WH, then I get it. I totally get it. Oh, I also hate Wuthering Heights with every fibre in my being. So so much. Passion of a thousand fiery suns etc. I’m reading Jane Eyre for my White Whale square (Thandie Newton audio version) but I’m thinking I might need this as a palate cleanser after.